Crabtree Creek State Park, established in 1943, is now known as William B. Umstead State Park. The land for the park was originally farm land. By the 1930s, single crop farming, largely cotton, had exhausted the soil and along with logging had led to erosion, rendering the land unsuitable for agriculture. In the mid-1930s, the land was purchased by the federal government under the Depression-era Federal Resettlement Administration program and rehabilitation of the land and development of a park begun. The project was administered by the National Park Service and employed workers under the Civilian Conservation Corps program. Crabtree Creek became one of many Recreational Demonstration Area parks created by the National Park Service from the 1930s to the 1940s to transform depleted or blighted land into urban parks and to put people to work under Works Progress Administration (WPA) efforts. At Crabtree Creek, on more than 5,000 acres of park land, Civilian Conservation Corps workers built damns to create lakes, constructed cabins, picnic areas and other recreational facilities, and worked to rehabilitate the poor, eroding soils. Structures were built in the rustic style typical of National Park Service and WPA park projects of the era. The Crabtree Creek Recreational Demonstration area structures are now listed on the National Register of Historic Places. In 1943, the federal government transferred the land to the State of North Carolina for $1, creating a state park. During segregation, Crabtree Creek was essentially but unofficially segregated, with two separate entrances, one for whites and one for blacks. In 1950, the southern 1,234 acres were split off and renamed, to create Reedy Creek State Park, the state's second officially racially segregated park. Crabtree Creek became the park for whites. Park offerings included scout camps for girls and boys. In 1949, the state legislature appropriated $316,549 for improvements at the park. 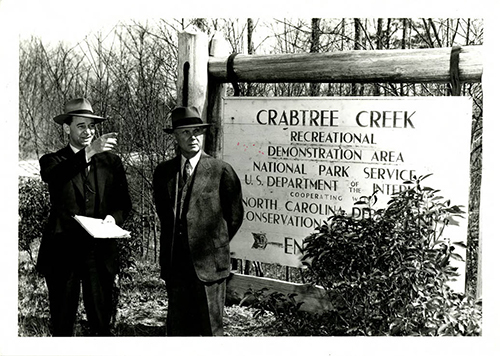 In 1955, Crabtree Creek State Park was rededicated and renamed for conservation advocate Governor William B. Umstead. North Carolina's state parks were desegrated between 1961 and 1964, and in 1966 the two separate parks were united into one park, William B. Umstead State Park. "Camp Sherwood Forest Opens in July to Girls Scouts from this Area." Burlington Daily Times-News (Burlington, N.C.), May 1, 1946. "North Carolina State Parks Scheduled for Improvements." Gastonia Gazette (Gastonia, N.C.), January 21, 1949. Mydans, Carl. "Cider mill at Crabtree Creek Demonstration Area." Photograph. 1936. 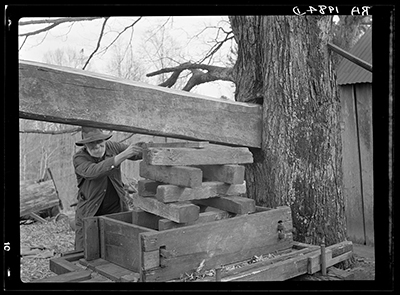 Farm Security Administration Collection, Library of Congress PPOC. http://www.loc.gov/pictures/item/fsa1998018371/PP/ (accessed December 28, 2015). [Transfer of Crabtree Creek Demonstration Area from National Parks to State Parks.] Photograph. 1943. State Parks Collection, NC Digital Collections. http://digital.ncdcr.gov/cdm/ref/collection/p16062coll27/id/175 (accessed December 28, 2015).